Tag line: "Ride it...in Sensurround"
I guess I was about 7 years old when my parents took me and my brother to a drive-in theater for the first time, and the double-bill playing that night was Jaws 2 followed by Rollercoaster. Well, Jaws 2 scared the hell out me, and I really enjoyed the film, not to mention the whole experience of being at a drive-in. Unfortunately, by the time Rollercoaster started, I was plum worn out. I vividly remember the beginning of the movie, where a rollercoaster goes flying off the tracks, killing a bunch of people, but shortly after that, it was lights out for me, and when I finally woke up, our car was pulling into the garage. It wasn’t until years later that I got to see Rollercoaster in its entirety, and I’m glad I did. Anchored by a pair of fine performances and featuring some tense moments scattered throughout, Rollercoaster is a thrilling ride (pun intended…and my apologies!). Several large amusement parks are being terrorized by an anonymous bomber (Timothy Bottoms), who’s already destroyed one rollercoaster, killing dozens in the process. To prevent further deaths, he’s demanding the owners of these parks pay him $1 million in cash. Harry Calder (George Segal), an employee of the Dept. of Safety, was the man who, two months earlier, inspected that coaster, and he’s determined to bring this murderer to justice. Harry advises the park owners to call in the F.B.I., which assigns special agent Hoyt (Richard Widmark) to the case, and as a result of his getting involved, the bomber begins to pay particular attention to Harry, calling his house at all hours and insisting he be the one to deliver the $1 million ransom. While Harry isn’t exactly thrilled to be in the middle of it all, it does offer him a chance to get inside the bomber’s head, thus giving him special insight into where this dangerous killer may strike next. 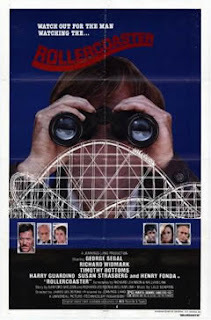 Rollercoaster starts out as a disaster-type film, but soon evolves into a game of cat-and-mouse, during which its main characters take center stage. When we first meet Harry Calder, he’s undergoing shock therapy to help him quit smoking. It’s obvious early on that Harry isn’t the friendliest guy in the world. He doesn’t get along with his boss, Simon (Henry Fonda), and can be downright pushy whenever he’s looking for answers. Segal perfectly conveys Harry’s gruff, impatient attitude, and is an effective contrast to Timothy Bottoms’ cold, highly intelligent killer, who’s usually a step ahead of the park owners, the authorities, and, for a time, even Harry himself. The bomber’s calculated approach to his “work” is evident in the film’s dramatic opening scene, where, after posing as a maintenance man to plant the bomb on the tracks, he looks on as the doomed coaster begins its run, quietly disposing of his cotton candy as he pulls the detonator from his pocket. The resulting wreck, with bodies flying everywhere as the coaster comes crashing to the ground, is tough to watch. The movie does have its clichés; many of the FBI agents tasked with tracking down the bomber follow cinematic tradition in that they’re mostly ineffective. But then, Rollercoaster was designed from the start to be a showdown between two men, and, fortunately, both Segal and Bottoms were up to the challenge. A very under-rated and under-appreciated flick. As you said the performances are good, also the locations are great, the lengthy middle part at King's Island is classic, it's like going to the park without being there, and then you have the great finale with Magic Mountain and an early performance by legendary band Sparks, what's not to like? !